On October 14th, noted Bharatanatyam artist Rukmini Vijayakumar and her team of professional dancers from Bangalore, India, performed an inspiring dance drama called Nayani about a tribal girl, at Southern Polytechnic State University in Marietta, Georgia. It was part of the first national fundraiser in the U.S. for the All India Movement (AIM) for Seva. This was the troupe’s last stop on a month-long 10-city fundraising effort which helped raise over $1.2 million nationally. The Atlanta show was coordinated and organized by Eshwar Money, Narayan Swami and their team of dedicated volunteers. The dance drama was a huge success, attended by over 400 guests who helped raised over $90,000. Mr. Mani Shanker also related his experience of building an AIM for Seva student home in his son’s name. AIM for Seva is a nonprofit started by Swami Dayananda Saraswati to aid underprivileged children of rural and tribal India. AIM for Seva has achieved Special Consultative Status with the Economic and Social Council of the United Nations and was a participant in the landmark Millennium World Peace Summit. Since 2000, AIM for Seva has helped 35,000 boys and girls get an education and healthcare in 15 Indian states by building 96 student homes (chatralayas), 20 schools, and 5 hospitals. Rukmini Vijayakumar, an artist, model, and actress from Bangalore, was initiated into Bharatanatyam and ballet 18 years ago. She began learning under Guru Padmini Rao of Tanjore. Rukmini has performed all over the world and founded the Raadha Kalpa dance troupe. Rukmini graduated from the Boston Conservatory with a Bachelors of Fine Arts in dance. 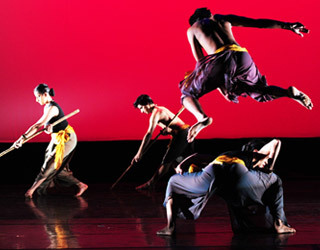 Rukmini is the lead dancer as well as the scriptwriter and the choreographer of this 90-minute ballet. The story of Nayani was written by her mother Vijayalakshmi a couple of years ago. Rukmini was inspired to adapt it for a dance drama when Swamiji approached her a year ago with the idea of a fundraiser through dance. The Bharatanatyam based dance drama began with a poignant tale about Lord Shiva’s inter-vention as a powerful archer when he saved the people from the wrath of Tripurasura by destroying the floating kingdom with a single arrow. As the kingdom went up in flames, Shiva smeared some of the ashes on his body, which found their way to earth. Wherever the ashes fell, a lingam arose. The forest of Amarkantak abounded with many such lingas. As the forests grew denser, the lingas were gradually forgotten with time. Nayani depicts the story of a tribal girl who was found, abandoned in the forest, by the chief, and who was taken home by him to bring up as his own. The villagers’ reactions are shown as she tried to fit in and yet remain different as a result of her divine calling to Lord Shiva. Rukmini used Bharatanatyam’s vast resources as a base and then embellished it with other classical theatrical elements. Her suppleness was complemented by her strikingly intense eyes that brought Nayani vividly to life. Parshwanath Upadhye, a Natya Mayura recipient and empanelled artist of the Indian Council for Cultural Relations, played the lead. He was supported by Pavitra Bhat, a national scholarship holder and gold medalist graduate with a Master of Fine Arts, and Suhail Bhan, a Bharatanatyam exponent who was also a semifinalist in India’s Got Talent and Just Dance. Shruti Gopal and Surabhi Bharadwaj, both Master of Fine Arts students, complete the female cast led by Rukmini Vijaykumar. Tirumale Srinivas composed soul-stirring music. Apart from being a well known vocalist and Mridangist, Srinivas is also a sought-after teacher and music composer. He has composed music for over 250 music albums of various artistes and or more than 160 rare Haridasa compositions. 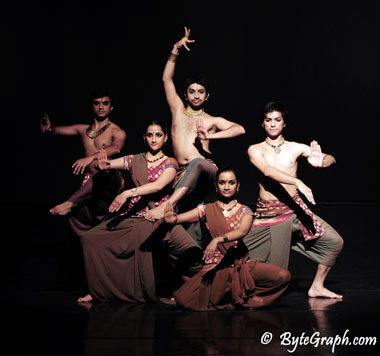 Nayani is one of the first Raadha Kalpa productions to tour abroad with a full ensemble. In addition to the Nayani tour, Rukmini is working on a project called Kochadaiyaan, directed by Soundarya Rajnikanth.